Wild foraging is one of the hottest new trends. People are eager to acquaint themselves with the soul of their local terroir. In Southern California, the delicious wild flavors of white sage, acorn, elderberry, walnut, toyon and other California native plants have been "discovered" by foragers and chefs, and people are heading into wild lands to gather these ingredients for cuisine with wildcrafted flavors and aromas. Problem is, our wild lands are already stressed from drought, invasive non-native plants and population pressure from Southern California's approximately 23 million people. When we forage bark, berries, seeds and leaves from native plants in our wild lands, we decrease the plants' ability to renew themselves. We also diminish habitat and deprive wildlife of the food needed for survival. Do foragers know that up to 90% of all leaf-eating insect species, such as caterpillars of butterflies, can eat only native plants? Do foragers think of their impact on wildlife when they remove acorns, elderberries and other native plant foods? And Southern California wild lands and wildlife are not alone in their distress. Migrating cedar waxwings on toyon in Southern California. 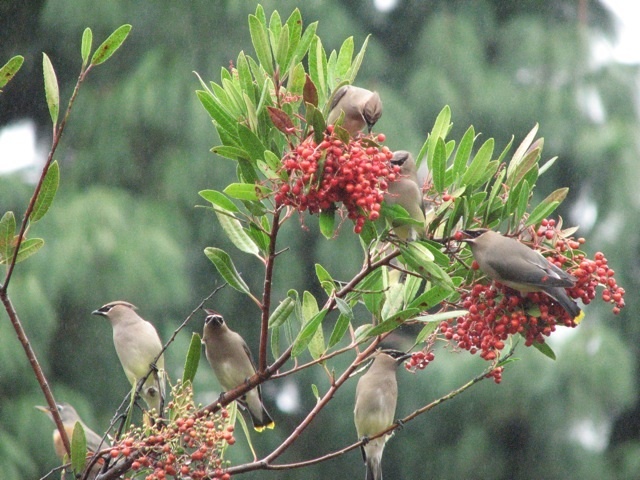 Waxwings need toyon because they are are berry-eating birds. It's easy to think of wild plants as renewable resources, and they are - when the population is small and the wild lands are vast. But now, in this day and age, it's different. If even a tiny percentage of our population goes into the wild, in search of native ingredients for our latest recipe, we will devastate what's left of the natural environment. One of the cardinal rules of foraging is for each person to take no more than 10-20% of what s/he finds. But if even an infinitesimal percentage of the U.S.'s 320 million people takes "only" 10-20%, it will be carnage. What could we do instead? We could do what people have done for thousands of years and what some are already doing: grow native plants at home or in community gardens. We could also farm native plants. Agriculture started with the realization that, for a given population, foraging was inadequate and unsustainable. Now, in a world of more than 7 billion people and vastly diminished wild lands, that realization applies more than ever. We should renew our urban and suburban spaces with native plants and forage in our gardens, not in what's left of the wild. We should landscape with the native plants we crave, creating more habitat, supporting biodiversity and decreasing our landscape water use. Native gardens provide sustenance to bees, caterpillars, butterflies, birds, lizards and people, among others. In contrast to foraging, native gardens are a net gain for Life. 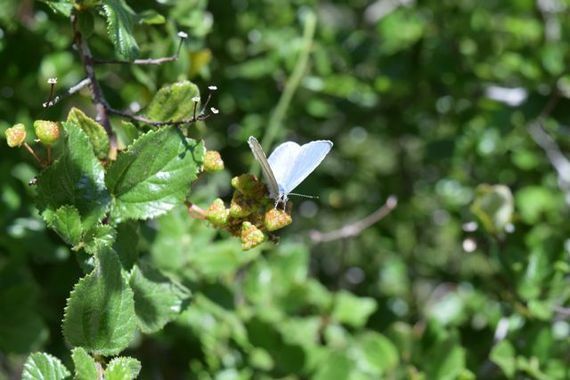 A spring azure butterfly laying eggs on the young fruit of Ceanothus, one of only two types of plants (both native to California) its caterpillars can eat. 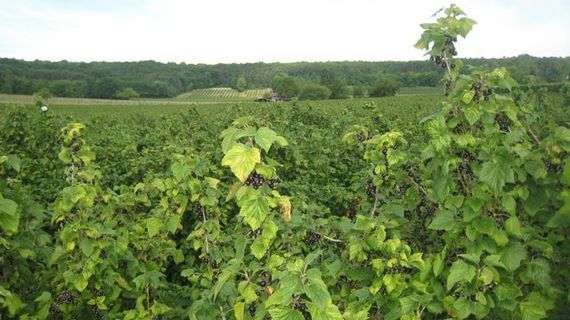 In our agricultural areas, we should convert some of the non-native monocultures to various native species that yield the desired seasonal ingredients and support healthy, functioning food webs and ecosystems. In Southern California, for example, there could be orchards of elderberry, toyon and Catalina cherry interspersed with white sage, buckwheat and manzanita. In fact, every part of the United States could celebrate its authentic natural character by cultivating native plants for their culinary ingredients. Chefs and others desiring native ingredients would be supporting the creation of some of the greenest jobs imaginable, and we would be regreening our local environment with native plants that support biodiversity. 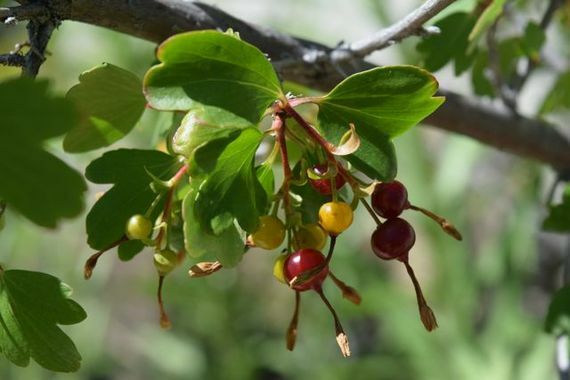 In my backyard garden, when my daughters were young, they foraged from our ridiculously fecund 'Dana Point' buckwheat (Eriogonum fasciculatum 'Dana Point'), golden currant (Ribes aureum var. gracillimum), and western elderberry (Sambucus mexicana). Before we left for a hike in the local mountains, we picked a few elderberry and mugwort (Artemisia douglasiana) leaves and put them in our pockets, just in case we ran into poison oak. People across the United States could similarly transform their urban and suburban landscapes to supply the native ingredients they desire. Many native plants are suitable for containers - a vast yard is not necessary. Visit a local nursery to purchase the native plants and, if the nursery does not carry them, ask that they begin to keep them in stock. Southern California is a biodiversity hotspot - one third of its native plants are found nowhere else in the world - and foraging in our wild lands for native plants further devastates these already shrinking populations of plants that have managed to survive the colonial incursions of the last 500 years. In Southern California and the rest of the country, we have predominantly landscaped with non-native plants that deprive the vast majority of our insect and animal species of the food and shelter they need for survival. Then, after erasing native habitat in the places we live, we go into our remnant wild lands and forage native plants. This is not just ironic - it's heart-breaking. In a world that is in the initial throes of a sixth mass extinction, this one caused by people erasing native habitat and negatively impacting the biosphere in all sorts of other ways, foraging native plants is not just irresponsible: it is tantamount to ecocide and comparable to eating shark fin soup or hunting elephants, whales and condors. The foraging movement is an understandable outcome of people yearning to reconnect with the natural world, but we must respect our remaining wild lands. They are precious. We must look beyond our desires of the moment and to the world we are leaving for future generations. It's great that wildcrafted cuisine has inspired more people to love their local natural environment, but instead of foraging, we must bring this cornucopia of "new" aromas, flavors and ingredients into our lives through farming and landscaping. Let's become even more intimate with the nature of where we live by cultivating the wild ingredients we desire. Let's respond to the natural world in a way that is not reminiscent of the rapaciousness of the past. Let's honor and enjoy the nature of place through cuisine that not only celebrates our terroir, but also celebrates the human ability to change and create a better world.